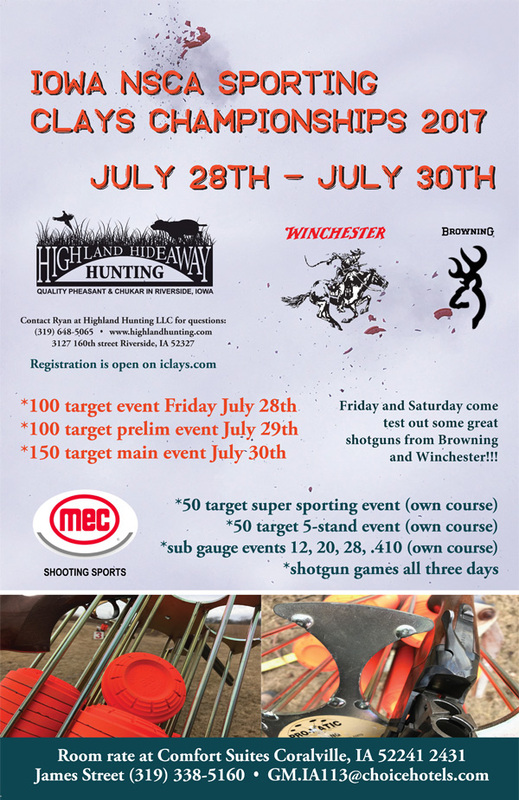 On Friday and Saturday please make sure to take a moment to visit the guys at the practice 5-stand to check out some new Browning and Winchester shotguns. Make-A-Break and a long shot game will be available during all 3 days of the event. With each main event entry, ONE Saturday night dinner is included. Dinner will be Wood Fired Pizza with a salad. Tea, Water and Millstream Root beer will be served with dinner, dinner is served by Provender Iowa. Beer and Wine will be available for purchase as well, served by Revasser Winery. Additional dinner tickets are available for purchase for $20 a person. A practice field will be available with tickets available at registration. Shells will be available for purchase at the club.